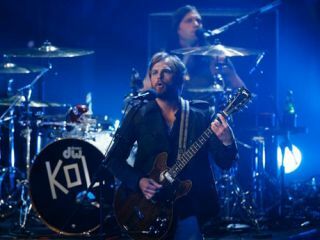 According to UK tabloid reports, Kings Of Leon's headline slot at T In The Park on Friday 10 July ended in a near brawl, with frontman Caleb Followill smashing his beloved 1972 Gibson ES-325 guitar and throwing the broken remains into the crowd. A source in attendance at the Scottish festival quoted by The Sun stated: "(Caleb) was livid about the sound and took out his anger on stage without considering the consequences. His guitar is now ruined. The crowd were oblivious to the sound difficulties but the Kings want every show to be perfect. "When they came off stage, tempers flared and they were effing and blinding at each other. It was really nasty before their tour manager stepped in." Despite fears that the band would cancel their appearance at Ireland's Oxegen Festival the following night, the atmosphere in the Followill camp was calmed sufficiently for the performance to go ahead. "Every time you have a sibling fight it usually cuts a little deeper than most. If you add the egos of being in a band... it's obviously gonna get a little hairy at times." "The guitar was just made for me. I'll put on a new guitar and it'll sound full and rich, but the second I play one of our songs with it, it doesn't sound like Kings of Leon. The 325, though, that guitar sounds like us. It's got everything. "When I got it, it was in mint condition, and now it's showing a lot of wear and tear - there's a hole in the body near the pick guard from my strumming. I worry about it. I don't know how long I'll be able to keep it. I have a few backup guitars, but the 325 is what gives me the sound, you know?" It looks like one of those backups - there's a red one in the Notion video - will now be elevated to main guitar status sooner than planned. Meanwhile, Scottish fans with fragments of the original now possess the ultimate piece of Kings Of Leon memorabilia.